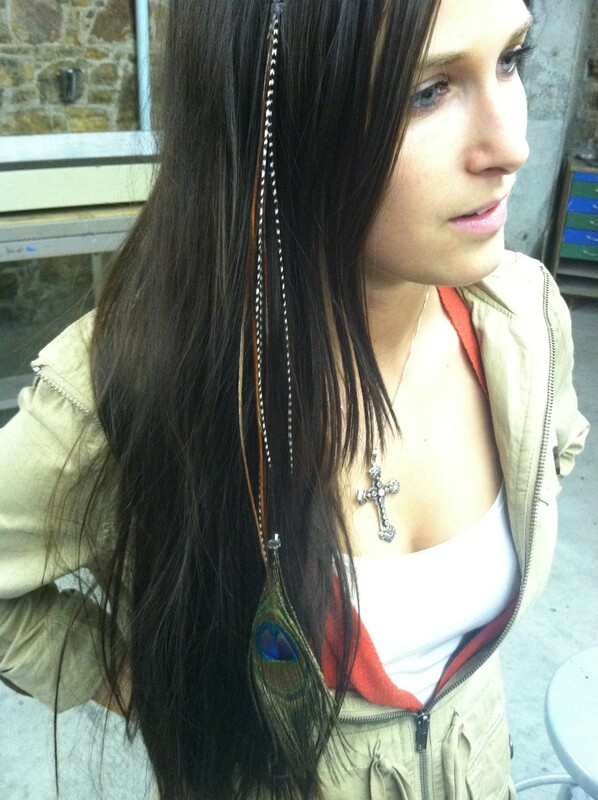 The latest trend to hit NDNU: feather hair extensions. I found out about this recent trend from my younger cousins a few months ago when I saw them at at family dinner with lime green feathers hanging from their hair. I was intrigued I even thought about putting some in my hair. I forgot about the idea until I spotted a student walking around campus with feathers in her hair and loved the idea of getting mine done. Margo Rasteiro, a junior at NDNU is shown to the right with her feather hair extensions. Margo got her extensions done at a salon near BelMateo Bowling Alley. I’ve talked to a few people that I’ve seen with “feathered” hair and a few have pointed me in the direction of Salon Sur La Rue in San Mateo. They will add them for $10 a feather or 3 for $25. I’ve been told that the feathers can stay in up to two months. I really like this trend but I almost feel like its too expensive for just 3 feathers. When I looked online I found a variety of feather extension do it yourself kits. These kits were all fairly reasonable and most were around $30. The kits include the hair extension pliers, clamp beads, and some wires to help get the feather where you want. Feathers are sold seperately but range from $2-$10 a feather, or you may be able to buy in bulk. When you do the math and determine if this is a trend you are going to embrace longterm it might be best to invest in a do it yourself kit. Regardless Feathers are in! My Name is Marissa, I recently graduated from Notre Dame de Namur University in Belmont. I just started law school. My blog has become a way for me to chronicle the fashions and trends on campus and to determine what's hot and what's obviously not. This entry was posted in Accessories and tagged Artificial hair integrations, Beauty, Feather, Hair, Hair Care, Hair Extensions, Health, Notre Dame de Namur University, Shopping. Bookmark the permalink.